While creating a beautiful, clean bathroom at home is easy, many would be hard-pressed to find a public bathroom that they would categorize the same way. 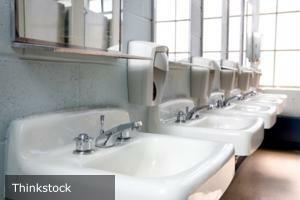 However, Cintas Corporation, which provides restroom supplies to businesses throughout the country, has named the top restrooms in America. The 10th annual "America's Best Restroom Award" has been given to the Field Museum in Chicago. "[They feature] sufficient stalls and sinks, as well as eco-friendly automated bathroom faucets and hand dryers," a press release on the award states. "The women's restroom has a special nursing room with a door, sink and small sofa for mothers. The restrooms also feature a family-friendly "tot area" with smaller toilets for its littlest guests. Additionally, Museum displays are featured inside the restroom for a fun, educational flair. The restrooms are cleaned every hour to ensure the facilities are in tip-top shape for the 3,500 visitors the Museum welcomes each day." Other winners include the Renaissance Arlington Capital View Hotel in Arlington, Virginia; the Scottsdale Center for Performing Arts in Arizona and the Snowbasin Ski Resort in Huntsville, Utah. The full list of winners can be viewed at BestRestroom.com. The public voted for their favorite public bathrooms via Cinta's online survey to name the winners. Over the last decade, the contest has attracted tens of thousands of voters. "We like to think of this contest as an entertaining way of drawing the public’s attention to the very important issue of restroom hygiene," said Cintas' Rich Bing. "People don't think about this issue until they walk into a poorly kept restroom, and then it matters. After that, the odds are they won't be back."